The 2 Nights 3 days Chitwan Jungle Safari Tour is a unique tour into the wilderness of nature. The tour is designed for all people who are interested in getting to know the variety of birds and animal species in Chitwan National Park. Chitwan National Park is the first national park in Nepal. It is a gorgeous conserved area that is home to some of the most exotic and rare species of animals in Nepal. The Chitwan National Park is home to 68 mammal species.543 species of birds, 113 recorded species, and plentiful wonderful vegetation. 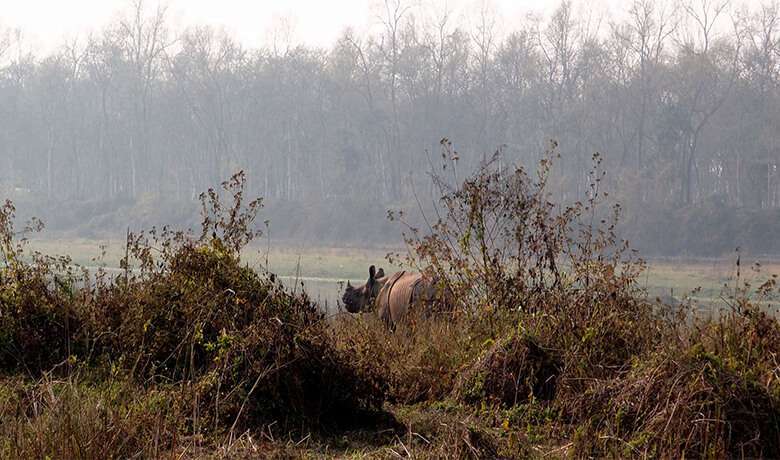 Chitwan National Park is only a few hours of drive from the capital city of Kathmandu. The Park is located in a place that is commonly referred to as Sauraha. In the national park, you can see some endangered species of animals like Bengal Tiger, One-horned Rhinoceros, etc. Chitwan jungle safari tour is also extremely popular amongst bird watchers. The variety of bird species whose sweet tunes are bound to delight you include endangered Bengal florican, the vulnerable lesser adjutant, Grey-crowned Prinia, swamp francolin, grass warblers, slender-billed babblers, egrets, bitterns, storks and kingfishers. The park provides a wonderful breeding ground for two-thirds of Nepal's globally threatened species. You will also be able to experience the wonderful culture of the Tharu community in Chitwan. This includes the Tharu cultural stick dance that you will be treated within the evening time. Tharu people are a significant part of the rich cultural diversity of Nepal. In addition, you will also take part in kayaking in the Rapti river. You will have an unforgettable experience while looking at the crocodiles, which generally take a sunbath on the river banks. You will be able to view crocodiles basking motionlessly under the sun often with their snouts open wide. This also makes for a wonderful experience of photographing these animals. The most wonderful part of the Chitwan Tour is the jungle safari. A jungle safari gives you a remarkable experience as it gives you an up-close and personal view of the habitats of the various wild animals in their natural environment. You can go for the jungle safari tour in the back of an elephant or in a jeep. Riding an elephant’s back gives you an excellent vantage point to see other animals. If you are looking to enjoy the tour of the jungle in the safety and comfort of a jeep, you can do that too. There are many animals that have been enlisted as endangered species that have been preserved beautifully in the Chitwan National park. These animals are the leopard, tiger, one-horned rhinoceros, alligators, elephants etc. If you are a nature lover, the sound of birds chirping as well as the sight of their graceful bodies are sure to delight you. And there is perhaps a no better place for this than Chitwan National Park. You will be able to see many of the 543 species of birds in this Chitwan Jungle Safari Tour. While you are out canoeing in the Rapt River, you will be mesmerized with the views of Marsha Mugger and Gharial Crocodiles. They often bask in their natural habitat. You will also be able to witness rare species of birds, reptiles and other animals in the wetland. The canoeing ride will give you an unprecedented view of these animals in their natural habitat in the closest proximity imaginable. You will also be able to explore the first national park in Nepal in all its natural beauty in the back of an elephant or a jeep ride. The exotic species of flora and fauna are bound to delight you. You can also see innocent elephants taking a bath in their natural habitat. This site is one of pure joy. Day 01: Arrive to Chitwan National park. Depending upon your preference, you will arrive at Sauraha Nana Hotel on a tourist bus or on a flight. Upon your arrival in this wonderful place, representatives from the hotel you will be staying in will pick you up at the Tourist Bus station or at the Bharatpur Airport. Upon arrival, you freshen up. After that, we will brief you about your stay in Chitwan National park during the rest of your stay here. At 1:00 pm, you will have a delightful Hi–Tea/Lunch. At 3:30 PM, you will visit the Tharu Cultural Museum. The ‘Tharu Cultural Museum’ is merely a few minutes walking distance from the hotel you will be staying in. After you have visited the museum, you will head out for the Tharu village tour. In this tour, you will be able to have a first-hand experience of the traditions, religions, cultures, and lifestyle of the people in this region. At 6:30 PM, you will be treated with the Tharu Cultural Dance. The participants of this dance are the locals from the nearby villages. The dance will encapsulate the rich traditions as well as dance moves that Tharu people have inherited from their cultural history. At 7:00 AM, you will be served your breakfast at the hotel. At 8:00 AM, you will head out for Canoe Ride/Boating. The canoe ride on the Rapti river could be one of the wonderful experiences of your tour. During the canoe ride, you will be able to enjoy sights of aquatic birds, crocodiles, Gharials and many animals on the river bank of Rapti. You will also get quite close to their natural habitat. Around 9:30 AM, you will visit the Elephant breeding center in the region. The breeding center is bound to melt your heart out as you witness the love and affection of mother and baby elephant there. This will help you appreciate a different side of these giant animals. At 12:00 NOON, you will return back to the hotel for your lunch. At 1:00 PM, you will go for the jungle safari on the back of an elephant or in a jeep. The choice is all yours. You will be able to see one-horned rhinoceros, several types of deer, monkeys, wild boar, bison, sloth bear, leopard and sometimes the Royal Bengal tiger. The elephant safari is 2 hours long. On the other hand, the jeep safari can last for up to 4 or 5 hours. At 2:00 PM, you will be perfectly placed for the Elephant Bathing programme. The elephant bathing programme gives you an opportunity to see the intimate side of elephants. However, the elephants bathe in the wilderness only in the summer season. So if you decide to come to Chitwan in the winter season, you will not be able to gaze at this spectacular event. At, 6:30 PM, you will go for a riverside walk that gives you spectacular views of the sunset. The sunset along the banks of the Rapti river is truly mesmerizing. At 8:30 PM, you will head back to your hotel for dinner. At 6.30 AM, you will have Breakfast at the hotel. Between 7.15 AM – 7:30 AM, you will depart from the hotel and make your way to your next destination. NOTE: Depending upon your preferences, requirements, length of your stay, there might be changes in the actual program. There also might be some subtle changes to the itinerary above depending upon the season you arrive or the weather of Chitwan during your stay. Finally, for your safety, we advise you not to stray from the instructions of your guides. Sublime Trails is a trusted name in the field of Travel or Tours in Nepal. We will make necessary amendments to the itinerary above in the way you see fit. 2 nights safari hotel accommodation in Chitwan with full board meal. All the Beverage during this tour then water and juices from the hotel. accommodation upgraded fees if you want to upgrade the hotel. After completing my trek in Annapurna Base Camp, I wanted to get a feel of a different facet of Nepal. So I asked Sublime trails, who had arranged my ABC trek, to arrange a jungle safari tour in Chitwan. It was a completely different experience to trekking. It was simply satisfying. The animals, the Tharu Stick dance, and birds added a magical touch to the tour. You should be here once in your lifetime. I have been an avid bird watcher since as far as I can remember. My wife also felt similarly about birds. My kids are animal fanatics who can't get enough of watching the channel “Animal Planet”. So I wanted to give them a glimpse of some of their favorite animals while we were holidaying in Nepal. We booked the 2 Nights 3 days Chitwan Jungle Safari Tour with Sublime Trials. I was as animated as my family members watching these animals. I was hoping that the tour never ended. The kids started to ask me when we would be back again for this tour. I hope we will be there again in the near future. You should join too.